5 Customer Service Myths Busted! I know a friend who recently started a company. He created a financial product for the other startups. No doubt that the product was great and very useful. He kept on asking his friends for the feedback including me and we gave him generous feedback and helped him improves upon the product. Everything was done and he launched the product. One thing that he never asked was what to do with the customer service? He was under the notion that if the product was great he doesn’t even need customer service. Just 1 month down the line, he had to call me up one night and we discussed the requirement of customer service at length and that time I realized there was lot of myths around customer service that people had. Let me talk about these Customer service myths and bust the bubble! Most of the Entrepreneurs think that Customer service is costly. But in today’s internet world, customer service has become cheaper. Yes, you heard it right; Customer service is cheaper than ever before. With services like Cloud Telephony, SaaS based tools; you can own a corporate like Customer Service call centre without spending too much money. Check out Knowlarity , Exotel , ZohoCRM to know more. This is another thing that most of the Entrepreneurs dread about. 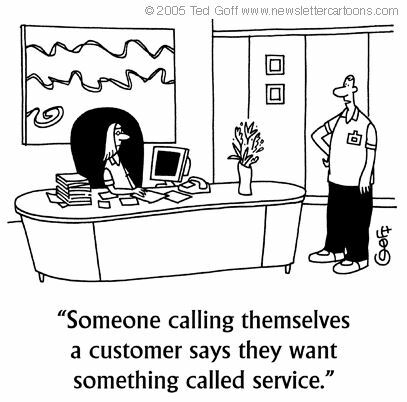 People, who don’t know much about Customer Service setup, think that it’s a lot of hassle to set up customer service. Believe me, there’s nothing better than having an in-house customer support, no matter how less customers you have. One good hire with proper training can set up a customer service for upto 100 customers. Moreover, this is expandable; you can continue to add more people once you have more customers. Another benefit that you can have, of having an in house customer support is the Analytics. Yes, service customers in house will create a lot of beneficial data for you. You can analyze that data and improve your product much quickly than your competition. This is the biggest myth and a mistake Entrepreneurs make with their startups. They think that setting up a social media page or a handle is enough for Customer service. Let me bust the bubble, It is not. Social Media is used for engagement and not to resolve general queries. In fact, social media is a more open channel and would affect your brand if the general queries start going out there. Social Media should be used to enhance engagement with the customers and get testimonials out. You can always direct complaints and feedback coming to your social media page to the service page. Or you can resolve them there as well, but keeping it the only channel of support is not a good idea. Another myth that Entrepreneurs carry about Customer Service is that it doesn’t need a strategy, just setting up a number and a person to answer calls will be enough. This is not correct, although, it’s simple to set up and manage customer service like I mentioned above but it’s important to have a strategy in place. A few common questions like what will be the channels of support? How will the common questions be answered? What kind of training needs to be given to the reps? What tools will be used? Still needs to be answered. There’s no harm in setting up a customer service strategy so that customers can be serviced in the best possible way right from point zero. This myth has been there for ages, we have been living with this for a while now. Entrepreneurs tend to believe that getting complaints about the business is bad but the fact is only 20% of the people speak up and complaint. That means, 80% of your customers who have had a bad experience won’t even tell you, but they will surely tell 6 more people about it and turn away your perspective customers. Wouldn’t you then like listen to those complaints and rectify those issues? After all, whatever business you are into, you are here to stay and do better. Complaints help you improve your product for better, in fact, someone who is complaining is giving you a chance to do better and change the experience that the customer had. Try and listen to those complaints very carefully and rectify them asap. Now, that most of the myths around customer service have been broken, you should also know that a good customer service team can enhance your brand value as well as repeat business. Customer service is an investment and most of the Entrepreneurs tend to ignore. Feel free to comment in case you have anything to add or ask.